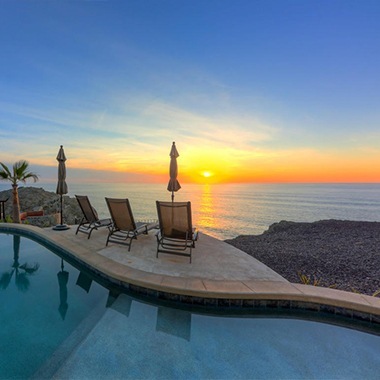 Secluded, one of a kind hilltop residence overlooking the Pacific Ocean. 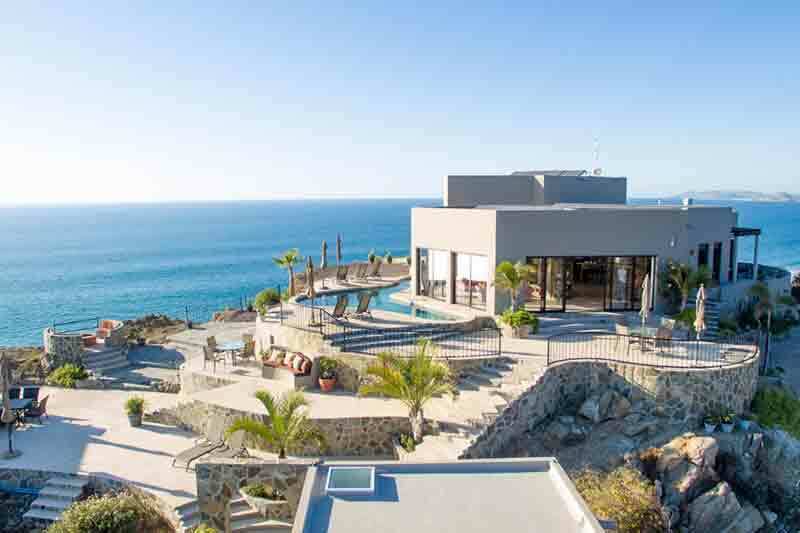 Perched on a clifftop with absolute privacy, you’ll enjoy 360 degree views of ocean blue waters as well as the Sierra de la Laguna mountains to the east. 4 spacious and private bedrooms, each uniquely designed with private ensuites and individual covered patios taking in unobstructed spectacular views and cooling sea breezes. 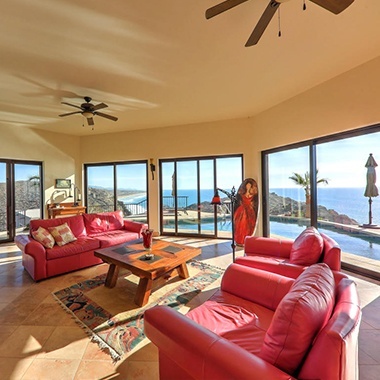 This unique home features a huge open kitchen/living/dining room with wrap around glass windows and doors flooding the space with light and vistas across the ocean from Punta Lobos to Migrino. The kitchen is spacious with custom cabinetry and counters and an 11 foot hardwood slab island. Floor to ceiling flagstone fireplace and stone bar add to the custom interior of this captivating space. To the east you’ll experience peaceful sunrises over the mountains and to the west, perched along the swimming pool, you’ll take in incredible sunsets. Or end you day at the brick firepit, 50 meters above the sea, watching the whales playing down below. Arriba de la Roca is a sustainable property. Built to optimize the use of the suns rays, all energy for this beautiful home is generated by the sun. Every room was custom built, using as many of the local natural resources as possible. All rooms and walkways are finished with stone harvested from the Sierra de la Laguna mountains, creating intriguing “natural” looking structures. The uniqueness of these structures and space was one of the reasons Blue Life International featured Arriba de la Roca in their 2014 publication, highlighting the “best and most exclusive” things in our world. National Geographic spent two days here shooting for their Spring 2015 catalogue. If you are looking for a place like no other, you have found it at Arriba de la Roca….meaning on top of the rock. 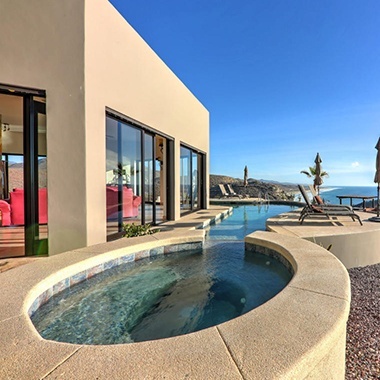 Located 35 minutes north of Cabo San Lucas, just a km off the newly constructed 4 lane highway. Close enough for the convenience of the city, but far enough to feel luxuriously secluded.